To those new in this blog, I track my spending every month. 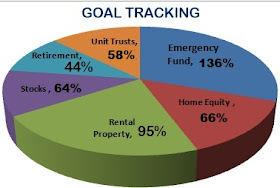 My goal is to spend 50% of my income in order for me (and hubby) to retire comfortably in early 40s. My November 2012 monthly spending and budget report is very late. October was a travel month for our family. Then the geyser (water heater) in one rental unit acted up leaving our income with a huge hole. Hubby Allowance 33% 52% What hubby gives to me. Once Off 1% 0% Interest free loan payment by my friend. Online Income 0% 0% I will get three months worth this month. I didn't. I finally received a fat cheque in December. Extra 8% 4% Interest on my Emergency Fund. Plus dividends, AGAIN. I so love Dividends. I wont lie about it. One thing that makes me unhappy is that the interest on my Emergency Fund is 4.65%, which is below the inflation rate. I will be reducing that money this month, for better financial gain. RA & Unit Trusts 7% 6% Fixed for my life insurance and the rest of small investments. Some of which I regret. Giving 16% 16% This doesnt seem to want to habour at around 10-12%. To Invest 54% 26% 54% is GREAT!!! I paid nothing to my homeloan, but the Mr did. Like every month I topped up my Just Invest (Nedbank) interest to a round R5000. then I started a Car Fund stroke stock picking. I lived on 46% of my income in November (comparing to 74% in October). Our Net Worth grew by just above R21K in November.